The Sunday comic strip "Closer Than We Think" was launched in 1958 at the dawn of the Space Race. But the strip's mission wasn't just to show Americans what would soon be happening on the moon and beyond. No, the space age would touch every part of American life — from the fuel that would power your driverless car to the dictating machine that would be built into your futuristic office desk. Even your bathroom would benefit from the advances being made by American scientists who were boldly pushing rockets (and by extension American consumer goods) into the future. 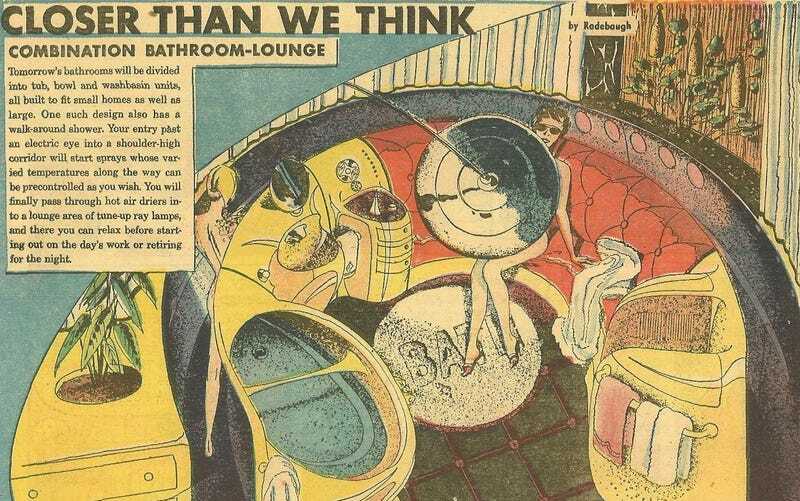 The May 18, 1958 edition of Arthur Radebaugh's comic included this vision for the bathroom-lounge of the future. The bathroom of tomorrow wouldn't just be a place to get clean, it would be a place to stretch out and relax. Just walk through the horseshoe-shaped shower and it will turn on automatically (thanks to an "electric eye" sensor), giving you a variety of different preset temperature options. Making your way to the other side of the horseshoe you'll eventually pass by the hot driers, making unsanitary things like towels completely unnecessary. Tomorrow's bathrooms will be divided into tub, bowl and washbasin units, all built to fit small homes as well as large. One such design also has a walk-around shower. Your entry past an electric eye into a shoulder-high corridor will start sprays whose varied temperatures along the way can be precontrolled as you wish. You will finally pass through hot air driers into a lounge area of tune-up ray lamps, and there you can relax before starting out on the day's work or retiring for the night. Curiously, despite both people in the comic appearing to be naked as the day they were born, there doesn't appear to be a toilet in this bathroom of the future. This makes some sense, given the taboos of the time. It would be another two years before Alfred Hitchcock's 1960 film Psycho would shock American audiences with a scandalous bathroom shot. No, not the grisly murder in the shower scene. Believe it or not, Psycho was the first American film since the introduction of the Hays Code to show a flushing toilet on screen. Another explanation for the lack of a toilet could be that tomorrow's bathrooms would be so large, we simply can't see it depicted here. Or maybe they're all cyborgs and in the future nobody has to use a toilet! In any case, this bathroom-lounge of tomorrow is yet another promise of the retrofuture that wasn't quite as close as we thunk.